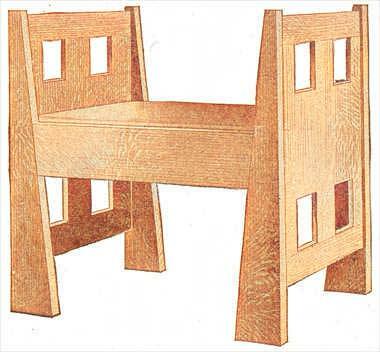 Click here for detailed hall bench plans. All the stock for this bench should be of 7/8-in. oak, excepting the slats, which may be of a cheaper wood. 2 cleats, 7/8 by 1 by 26 in., cheap wood. 4 end rails, 7/8 by 2 by 16-1/4 in., oak, S-2-S.
2 ends, 7/8 by 16 by 16-1/4 in., oak, S-2-S.
2 sides, 7/8 by 4 by 25 in., oak, S-2-S.
2 pieces, 7/8 by 5-1/2 by 25 in., oak, S-2-S.
Start the work by first cutting the two pieces of 7/8 by 5-1/2 by 25-in. material diagonally 1 in. from each corner, thus making the legs. The edges are planed square and the ends should be rounded a little so that there will be no splinters projecting. The legs are mortised 1 in. deep for the side rails. The tenon ends are cut on the rails, care being taken to get the right angle and a good fit. These can now be fastened together, using hot glue on the entire surface of the joint. While these are drying the ends can be made as shown in the plan. The 3 by 4-in. holes are cut at equal distances apart. Be sure that each end is perfectly square, then glue and dowel the 2-in. strips at each end. The ends are then glued and nailed to the sides, using finishing nails, which are set and the holes filled with colored putty. The cleats are now fastened, extra care being taken when fastening them over the joints where the legs receive the side rails, as this will help to strengthen the joints. The slats rest on these cleats and are placed at equal distances apart. The bench is now finished, but before applying the stain, see that all parts are free from glue and are well sandpapered. Use a loose leather cushion to finish the bench.